Carte Hydrographique du Departement de La Seine. 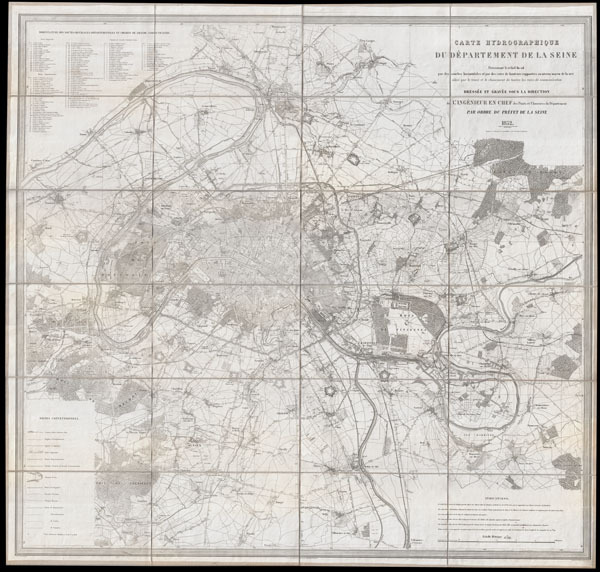 This is an extraordinary large format folding map of Paris and its vicinity dating to 1852. Covers from Argenteuil in the northwest to the Foret de Bondy in the northeast and from the Bois de Verrieres in the southwest to Bois Notre Dame in the southeast. Offers extraordinary detail on a monumental scale, showing roadways, waterways, topographical features, and in many cases individual buildings. Prepared by the Engineer in Chief of Bridges (and Chaussees ?) by order of the Prefet de La Seine. Published by Andriveau-Goujon. Very good condition. Dissected and mounted on linen in 24 sections. U.K. National Archives, WO 78/543.